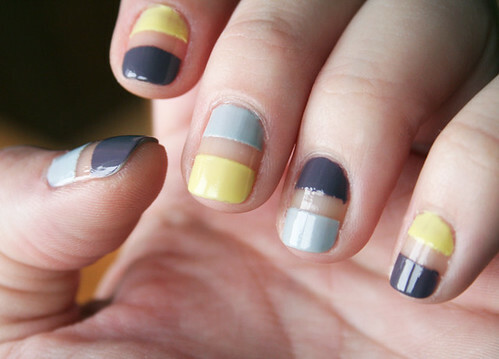 Once in a while, inspiration and ideas are just not there (and who would I be with bare nails, I ask you. lol) and so you end up just painting them simply (which is fine too, can be real nice results when with mixing colors as pairs or trios, too!). After a few days, I might get bored tho. But still liking the colors. SO! The solution: pimp them! 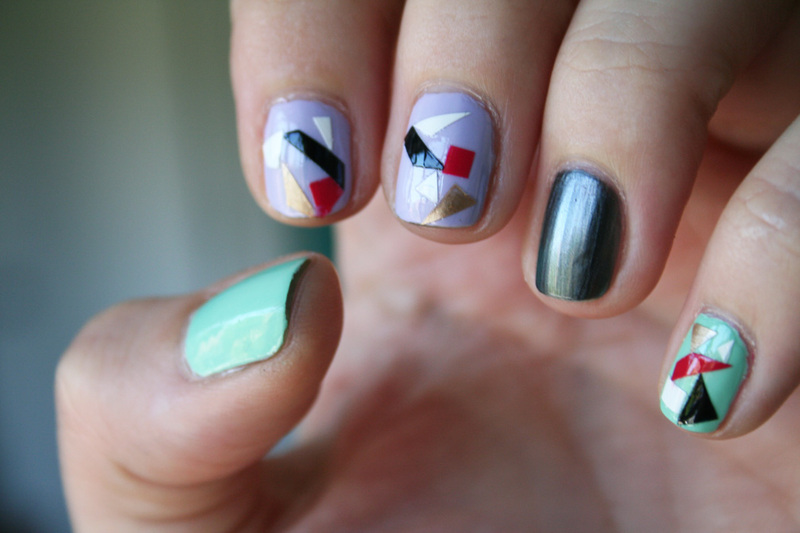 Under is a little visual tutorial on how I pimped these once simple nails into a little bit of a funky geometric visual a few days later. 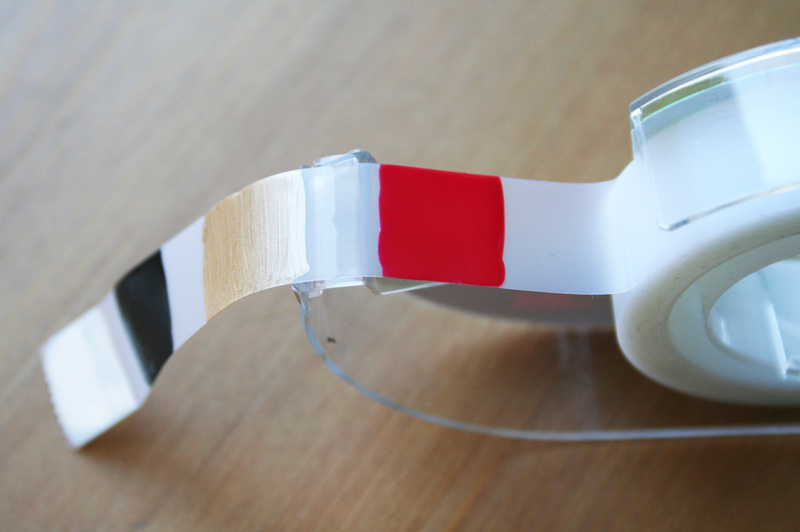 Make sure to use white scotch tape (color adheres better! ), and let it dry an appropriate time before cutting little shapes with scissors. Also, apply one (or even two) top coats after finishing your design. 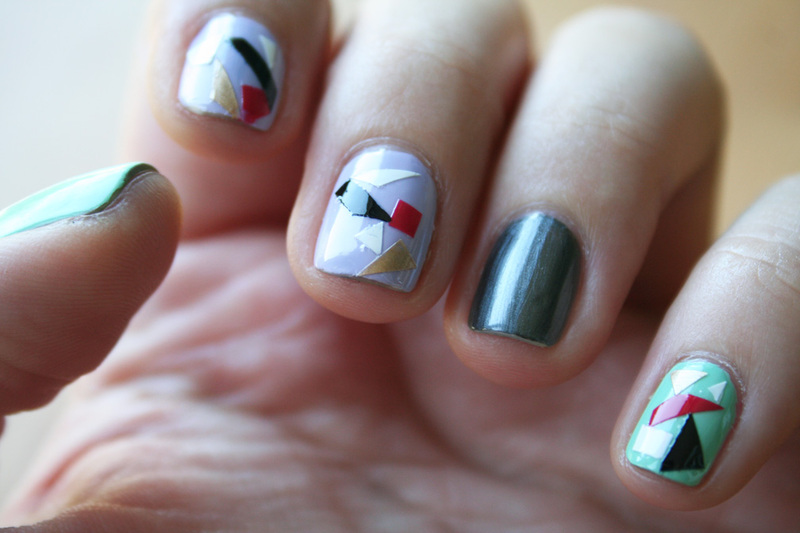 This way, you’ll extend your manicure’s life for another couple of days. 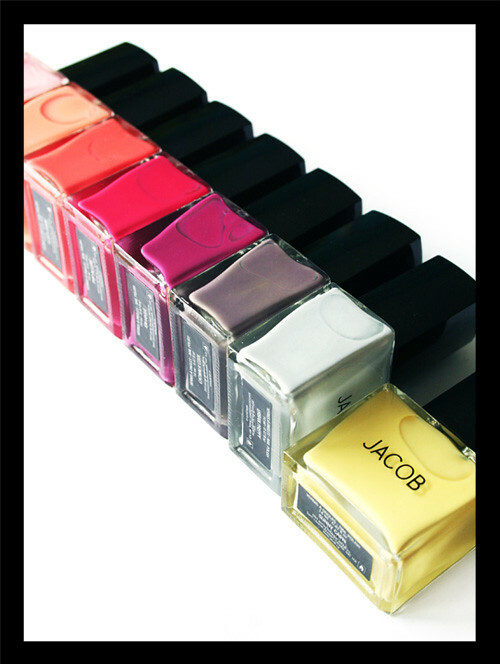 I also felt the need to put 2 hours on 2 pictures of nailpolish bottles (seen up there, 1st and 3rd pictures. What do you think?). I dunno what got into me, but anyway, I had lots of fun! SO! Here’s my review of these babies! The good AND the bad! • Colors are FAB! Very Spring, flashy or pastels! •The “Sunny Capri” is exactly the kind of yellow I was looking for: not too soft, not too flashy! 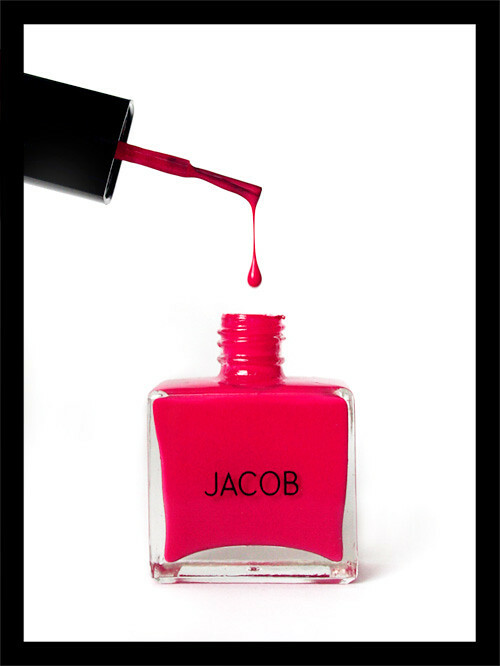 • The “Pop Allure” is a perfect in-between of red and raspberry pink, I adore it! • As you can see in the 2nd picture, 5 of them happen to create a wonderful 5 toned gradient, a trend I wanted to try for a while now! YAY! • The price, $6 a bottle (promo of 3 for $12 online as I’m writing this right now). • Most had a nice texture (not too thick, not too sheer), and most were only 2 coaters. • Easy to take off, not too messy in doing so. 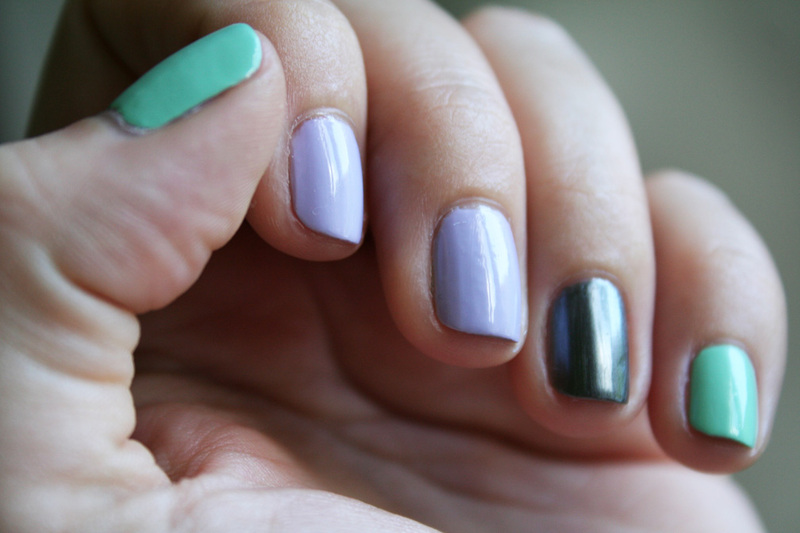 • 3 of them are definitely 3 coaters (which is annoying to me, I’m a one coat gal, even…). That is “Sunny Capri” (yellow), “Miss Mousseline” and “Retro Chic” (the two lighter pinks). • The yellow tinted my nails a little (but then again, I *could* have put a base coat. I hear you in my brain, people. lol!). Then again, the tint left over wasn’t overwhelming or anything, so don’t deprive yourself of this beautiful tint EVEN without base coat, me says. • (2nd picture, left to right): Miss Mousseline, Retro Chic, Flirty Bikini, Pop Allure, En Vogue. • (4th picture): Catwalk Cool (greyish dark purple), Urban Preppy (light grey), Sunny Capri (yellow).